This is a simple and lightweight Hawaiian print straps backpacks, it features a duo heavy duty nylon straps, an external pocket with zipper for secure personal items. 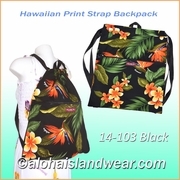 This bag can be used for holding work out clothes, towers, shoes when going to gym or doing Yoga exercise, holding groceries when shopping, holding books, lap top, Ipad for students, carrying your personal items when traveling and much more. External pocket: 16" X 11.5"